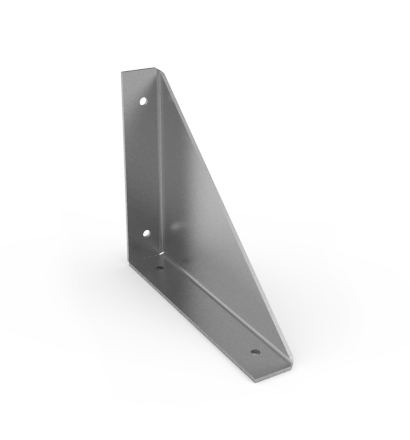 You need a sheet metal bracket but can’t find it at the local hardware or superstore. Look around the room you are in. Chances are you will see a number of applications where metal parts are used to hold loads that you take for granted. Desktops, shelving, countertops, even flooring are held up with bracketry of some type. So you decided to design your own sheet metal part. 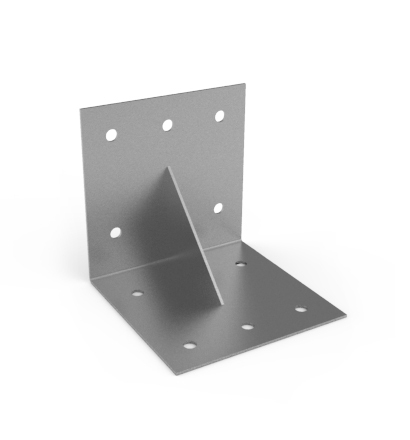 Use the following simple guidelines to formulate and design the type of sheet metal bracket you will need to successfully meet your requirements. The starting point is determining what loading your metal part will be required to hold. We will assume that the loading that you are designing to is a static load as described below. Static Load - A load which does not undergo a change in magnitude or direction during a measurement procedure. Essentially it is a load that is not moving around, like a shelf with books on it. There is a very complicated formula that determines the deflection of the bracket under load. To review a resource related to bracket deflection visit our Bracket Beam Deflection Paper. 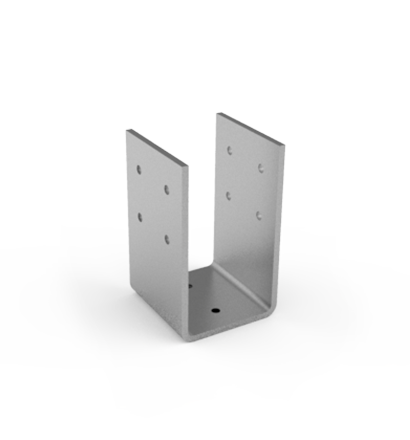 The shape and dimension of your bracket will be determined by the shape of the item it is holding up but will also be affected by the load capabilities and the ease in manufacturing (cost control). Keep in mind that strength considerations of metal bracket design are not just functions of the material thickness but of the bracket shape. As a metal part, as adding specific features to the bracket can improve strength dramatically. Below is shown 2 metal part designs, both are of the same thickness but the first part will be significantly stronger due to the gusset (small triangular piece) welded on the bracket. This is a nice feature for keeping the profile of the bracket small yet creating a strong bracket. A simple “L” shape should do. One leg bolted to a stud and the other where the ladder is placed. The ladder is only 4” wide so 2 pieces of a 6” x 6” x 2” wide “L” bracket would work fine. Deflection of this bracket under the 40 lb ladder will be .014” or essentially no deflection. This ¼” metal L bracket is plenty strong to hold the weight of the ladder. 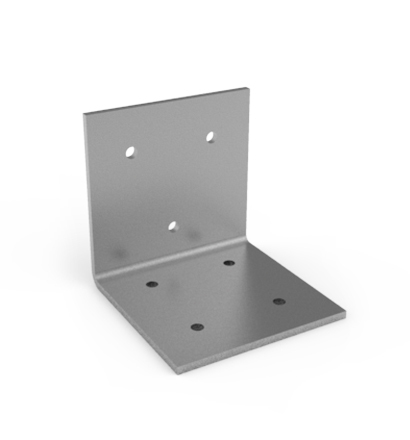 Almost all brackets have some type of mounting holes. In our case we need 2 holes on the 6” length being bolted to the stud. A ¼” lag bolt should do the trick See Screw Types Resource Here and see Bolt Types Resource Here. It makes sense to space the bolts evenly on the 6” face and in the center. Since I am using a ¼” bolt then we need the hole diameter size to be .26 inch. (1/4” = .25 so we need a little larger hole to accommodate the screw.) If you are using wood screws then oversize you hole about .10 to .15 for clearance (if ¼” screw use .26 hole). The metal bracket as it was described to be designed can be seen below. If you would like to have the holes of your metal bracket threaded, this is referred to as a tapped hole. This might be needed if you were mounting something into the bracket but did not have a nut on the opposite side. For instance you were mounting a electronic device onto a bracket and could not get a bolt on the opposite side. If you want the head of the bolt or screw to be recessed into the bracket, so that the top of the fastener is level with the surface of the metal bracket, this is called countersinking. For more information on hole treatment, please refer to our Fastener Hole Treatment Resources here: Hole Treatment - Countersinking and Hole Treatment - Hole Tapping. The standard material finish on your metal part is important not only from an aesthetic viewpoint but also to help in resisting rust. If the use of the bracket is outdoors you definitely will want to have a durable paint job on a raw steel part. Galvanized or stainless steel material may also be used to resist corrosion. For more details on these finishes visit our Metal Finishes area of the Resources Center. You want to control your costs and the best way to do this is to make the bracket easy to manufacture and selecting the right material. Stainless and Aluminum are almost 6 times the cost of raw steel (Colled or Hot Rolled). If your metal part can be made from standard steel, it would be best to choose this material. Note that in smaller runs that require painting for corrosion resistance, it may be more economical to go with a machine galvanized steel that will not require paint. Most fabricators these days have the ability with lasers to produce any shape you want. Flat plates of varying design are simple to fabricate. If you can keep your metal part flat, do so. Keep in mind that you will be paying for laser time so the more intricate the part the more time to fabricate. Again, keep it simple. If you can keep your hole pattern symmetrical and evenly spaced then do so. If you have special part design features then you may require a hole pattern that matches. Special hole patterns can add cost to your metal part. Keep the design simple and symmetrical. L shaped brackets are the easiest to make. As you get into pan shaped parts and “U” shapes expect to pay more for the time spent forming the part. Rolled parts with large radius (above ½”) need special tooling or must be rolled. This is normally an added expense. On a “U” bracket when the height of the part is larger than the brake then this can be an added expense because most brakes can not form this so it has to be welded. The part below gives you an idea of this design where the sides are much higher than the bottom causing special tooling or an additional operation to be done. Try to avoid this if possible. We discussed adding gussets and other features that may require welding. Although a great way to improve strength, it adds costs to the fabrication of your metal part. Welding is an expensive operation. Make sure you need to weld a part before designing it in a manner that welding is required. If at all possible avoid the process of welding. Designing a metal part is actually pretty simple and straight forward. If you follow the simple approach as shown above you will develop an easy to manufacture, cost effective and very functional bracket. Short Run Pro makes the part designing and sourcing process easy. Put our years of metal fabrication experience to work for you on your metal part project. To get a quote on fabrication services Submit Our RFQ Form Here.